Four types of coal, arranged in order of the process of coal formation, or coalification--plant remains that have been compacted, hardened, chemically altered, and metamorphosed over geologic time. 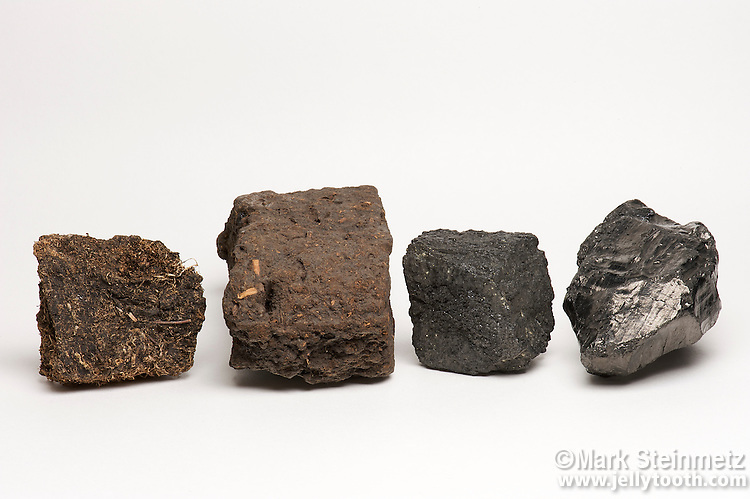 From left to right: bog peat (Ireland), lignite coal, bituminous coal, and anthracite coal. Anthracite is the ultimate stage of maturation, producing a hard, dense, shiny, rock that is the cleanest-burning, highest rank of coal. It makes up under 1% of known coal reserves.